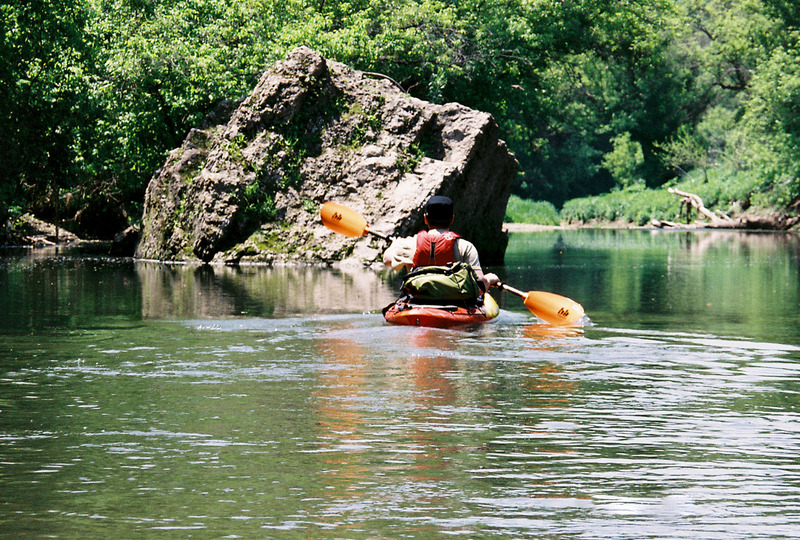 This short but popular paddle offers some swift creek-like paddling with classic driftless surroundings but the agriculture run-off and erosion leaves something to be desired. Time: Put in at 11:15a. Out at 2:15p. Day two of our paddling trip to Southwestern Wisconsin led us to the Galena/Fever River (we’ll stick to the middle of the road and let others argue over the correct name) which is covered in detail by Mike Svob in Paddling Southern Wisconsin. It’s a riffly and generally clear river sharing similar characteristics to the Grant River which we paddled the day before. The river is never very wide, feeling more like a creek than a river but definitely wide enough for a a couple canoes or kayaks paddling side by side. The paddle is a little over six miles, a perfect length for a short day trip. The abandoned train tunnels are the most interesting and unique feature of this river (well, and paddling around cows) unless you’re really into farmland. The put-in was nice and easy to access. The same couldn’t be said for the take-out. We had to exit at an alternate bridge than the one described by Svob since it was gated off. We found a little waterway (or creek?) that veered off the river towards Ensche Road to a different bridge. It was a difficult, weedy and steep climb around the wingwall of the bridge. Not ideal or paddler friendly. The night before we camped at Grant River Recreational Area It’s a federal campsite, run by the Army Corp. As mentioned in Grant River I, it’s a busy RV-style campground right next to the train tracks which was ever busy and quite loud. It’s not the kind of campground you would put on your list of relaxation destinations but it served us well for a night. Speaking of lush farmland, there is a lot of farm run-off. In fact, you’ll probably run into some cows literally craping and peeing in the river. There is a 1.5-2 mile section of “cow-crossings”. It’s clearly marked because you have to duck under some cable at the beginning and the end. I’m not sure we’d mark this one for a return visit. It wasn’t so unique that it’s worth the trouble. The Yahara River is this, a little more and in our own backyard.